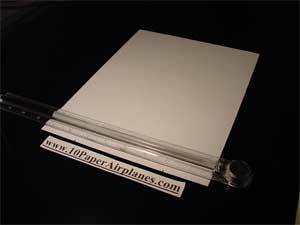 Learn how to make 10 great paper airplane designs with free, easy to follow animated instructions! The Champ is (to my knowledge) the current record holder in the Guinness Book of World Records for the paper airplane with the longest flight time. It was created by Ken Blackburn and is an excellent flyer. 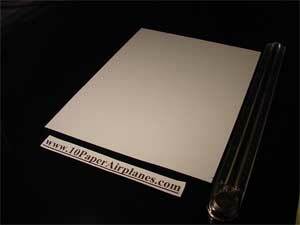 To make this paper airplane you will need only a single sheet of paper. 1. In this step we are going to mark where the first folds will be, once you make this plane once you should be able to eye it and will no longer need to measure. You may connect the points along each side with a pen or pencil if you like. 2. Make your first two folds long-ways, from the outside dot on one end to the outside dot on the other. 3. Beginning at the narrow end of the paper, fold it down evenly about 1/2 inch. Repeat this step for a total of 8 folds. Keep your folds as tight and even as possible. 4. 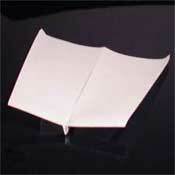 Flip the paper airplane over and fold it in half. 5. Fold down both wings parallel to the middle crease and about 1 inch away from it. Make sure both wings are even. 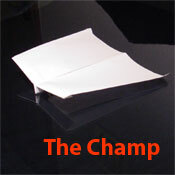 Your Champ may need some fine-tuning before it will fly well. If it dives, slightly angle the rear of the wings up. If it climbs and crashes, slightly angle the rear of the wings down.